Top quality total plumbing service for all your plumbing needs! Serving Conroe, The Woodlands, Montgomery, Willis, and all communities surrounding Lake Conroe. You will be impressed by our Cleanliness and eagerness to serve you. Welcome to Conroe Plumbing. We are standing ready 24 hours a day, 7 days a week, 365 days a year, waiting for your phone call. We schedule our business according to YOUR convenience. 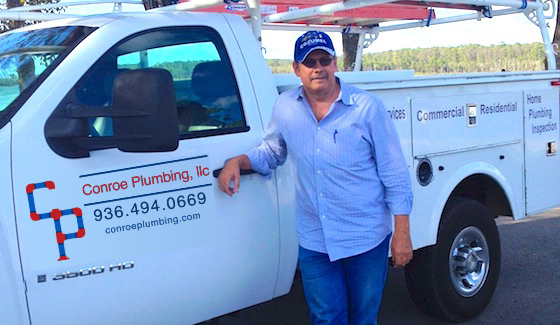 Conroe Plumbing is a member of the Greater Conroe/Lake Conroe area Chamber of Commerce and we are also a Better Business Bureau accredited business which means we are held accountable for our quality of work and customer satisfaction. When you call, you will speak to a LIVE person, offering immediate emergency assistance, or future service based on YOUR schedule.